The retreat starts on a Friday at 4pm and end on Sunday at 1pm (3day). We will study the Bhagavad Gita, Yoga Sutras of Patanjali and some other texts on non-duality and awareness (books to be supplied), with an emphasis on the Scriptures in relation to our Yoga practice, direct experiences and cultivation of awareness. I stumbled by accident on the following article which made interesting reading on the subject of Silence, take a look, you might be happily surprised especially if you are feeling apprehensive about not talking for a while, click link - SILENCE ARTICLE or find file attachment below. The retreat will focus on bringing the mind under control allowing us to connect with out inner Self. Under the guidance of Peter Petrou, who has 12 years experience in teaching Mindfulness techniques, Meditation, Yoga and Pranayama, outer silence will be used to cultivate inner silence. Silence gives us immeasurable benefits; It allows us to observe our emotions and our thoughts reducing their power over us. We experience directly how we can take control of our lives. Our mind becomes sharper, stronger, more focused. 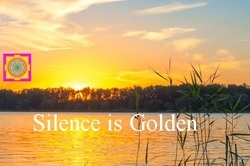 Ultimately inner silence is the our centre of our being and creation, a place of intuition, love and joy. Silence is not a place of no sound but a very vibrant fully alive feeling, silence talks to us from the heart and gives us all that we need. €200 (3days), €300 (4days) inclusive of accommodation, food, tuition and books. Payment in full is required to confirm your place. Full refund will be available up to one week before the start of the Retreat otherwise a €100 cancellation fee will apply if your place cannot be taken by someone else.